One important purpose this blog serves to highlight for myself the progress that I do make. I don’t need to record for posterity all the things I’m not good at, as there are so many, many more of those. But when I reflect on the session while I still remember, I can pull out those pieces that I’m learning, improving, noticing, and practicing, and then that makes me happy both at the time of writing and later when I hop around randomly through older posts. Today I took River down the drive toward the front of the ranch and created a point-to-point with cookies at each point. I wanted her to walk freely but I tried not to oversqueeze, over-urge. Just … walk. And get a cookie. I wanted to see if she would of her own accord begin to relax and use her body. 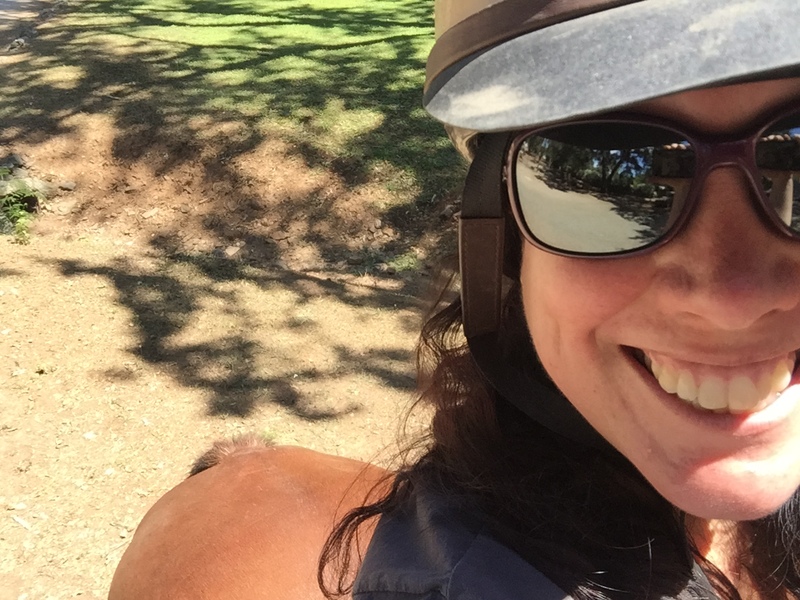 I thought about something my friend Barbara learned in a lesson earlier this year, about how many laps of “just walking around the arena” it took before she herself blew out and fully relaxed (“I thought I WAS relaxed!”) and how many more laps it took before her horse did the same. So I just kept going between the two points, with a couple of detours to refill the cookie pouch or to help someone with the driveway gate. And River did blow out, long after I’d forgotten that I was paying attention to it, and long after any observer would have assumed she was relaxed. Her slow, low-headed amble looks relaxed. She’s even mostly relaxed, and not looking for things to pretend to spook about, not exactly balking or obviously sticky. But I’m learning to feel how she’s not “free” and to wait for that freedom before changing our pattern. 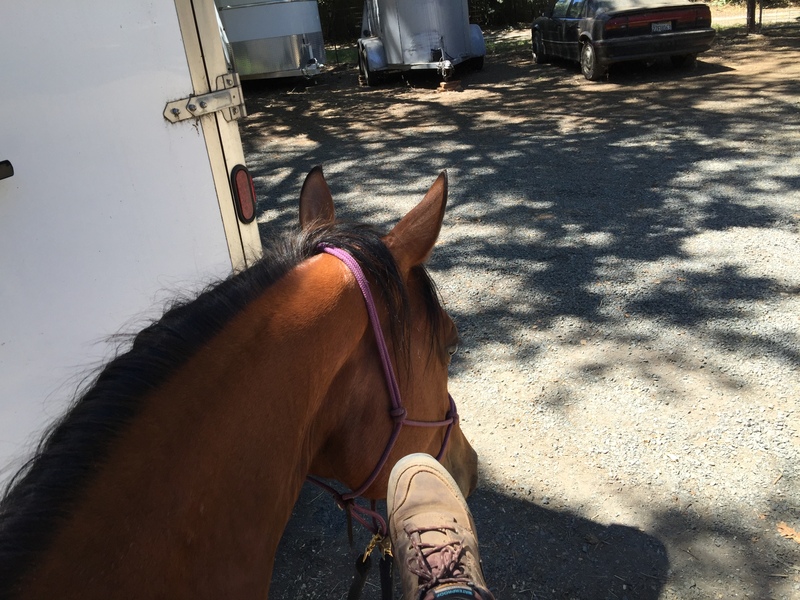 A Thing I’ve been noticing in my past few sessions with River, including this past weekend’s lesson, is that after we got that really nice soft harmonious day, our rides have been progressively (regressively?) less soft each time since. That’s what led me to changing something up. (That and the presence of summer horse camp using the arena.) 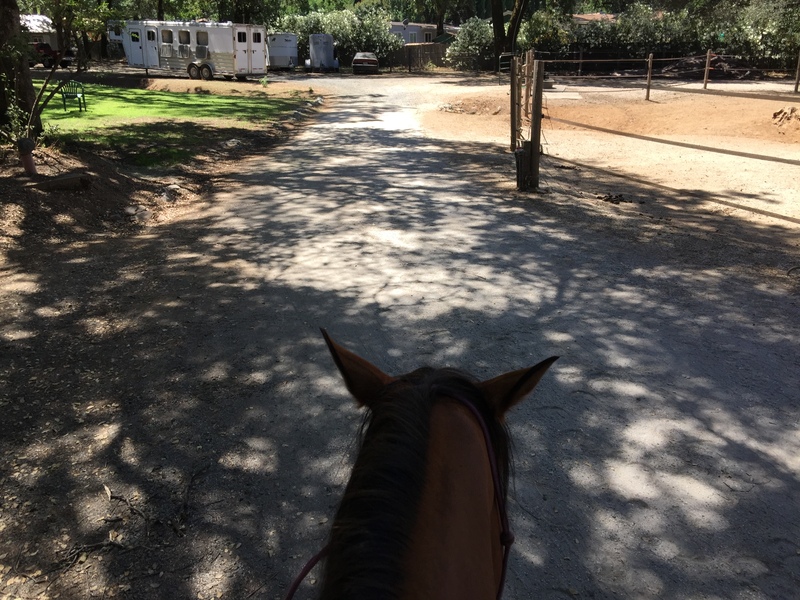 Also, I’ve developed some anxiety about certain squeezes on the ranch when I don’t have a saddle, so I thought about all the places I feel comfortable and set up the pattern there. We had enough distance between points to feel like we were going somewhere, and that helped too. I am really trying to pay attention to the concept of relaxation in her poll and jaw, to the bend as we turn, and to the sticky vs. free quality of her gait. While I’ve become much quieter in my body (and Erin complimented me on this in our lesson! ), I think I’m also confusing River now, lifting the rein, trying to put my leg on in a place that makes sense, clucking (why? WHY? ), urging her forward while lifting the rein and then bumping her when she doesn’t bend her nose after several seconds (I wait a while because I need to not develop a habit of lift-BUMP-PULL).